CFL bulbs — a bright idea! 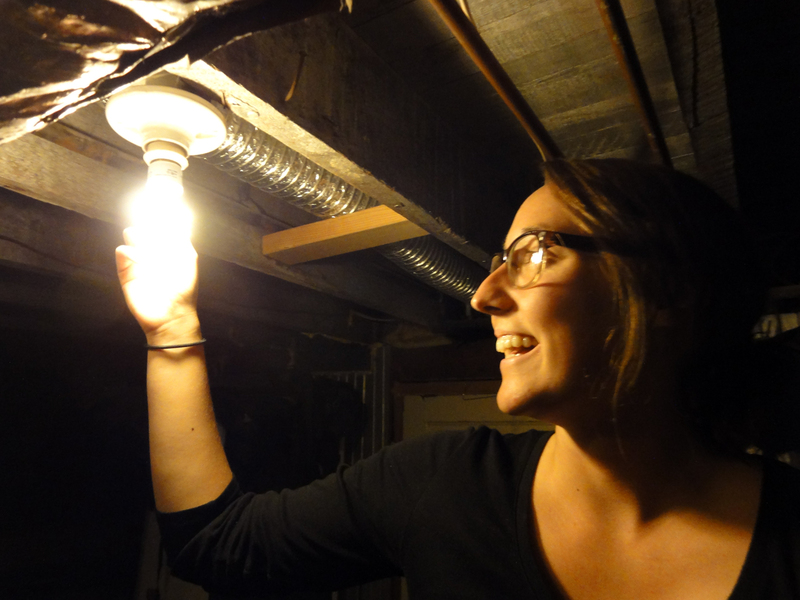 Student Energy Ambassador Carlie Teague installs an energy efficient light bulb during a recent home energy audit. It started out just like any doctor’s visit, with a questionnaire and a quick temperature check. Next came a few more exams, and then, after about an hour, the docs gave their prescriptions. But the patient wasn’t a person, it was my house—and the docs weren’t physicians, but U of U Student Energy Ambassadors Carlie Teague and Haoran Yu, invited over to perform an energy and water audit of my home. Their verdict? Energy-wise, my little house could stand some doctoring. This is the third year the Sustainability Resource Center, in partnership with Rocky Mountain Power and Questar Gas, has offered home energy audits for students through the Energy Ambassador program. The program helps students save energy, water, and money through installation of energy efficient supplies, including compact fluorescent light bulbs (CFLs), high efficiency shower heads and faucet aerators, and “smart” power strips. 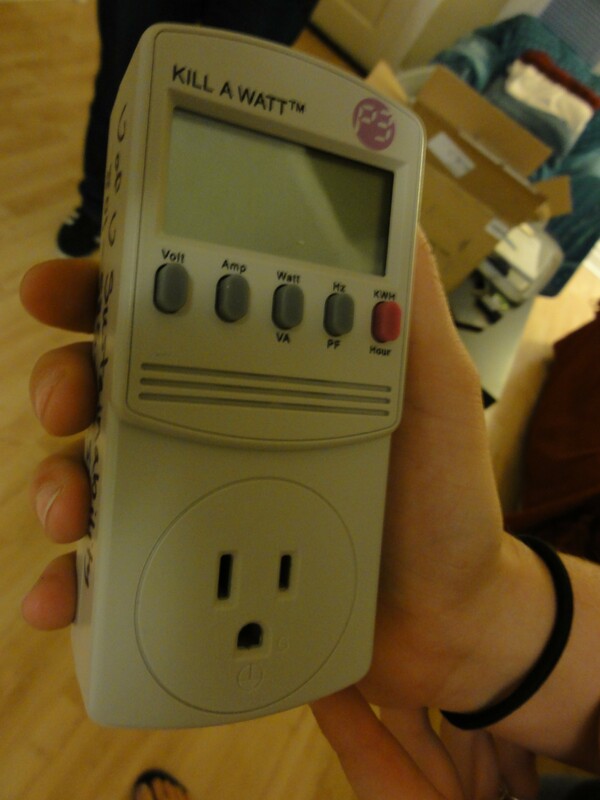 The “Kill A Watt,” a device that measures phantom power consumption. turns out, I don’t always remember to power down my plug-in power strips. Carlie and Haoran used a small device called a Kill A Watt to show me the rate at which “phantom power,” also known as electricity leakage or standby power, is drawn from the wall by each of the devices I plug into those power strips—even when they aren’t turned on. My cable box, for instance, draws phantom power at a rate of around 10 watts—a not-insignificant flow that adds up to a lot of wasted energy over time. To save energy, the Ambassadors also hunted down my three remaining incandescent light bulbs—two hiding in the basement, and one tucked under the hood over the stove—and replaced them with 13W CFLs that use far less energy. 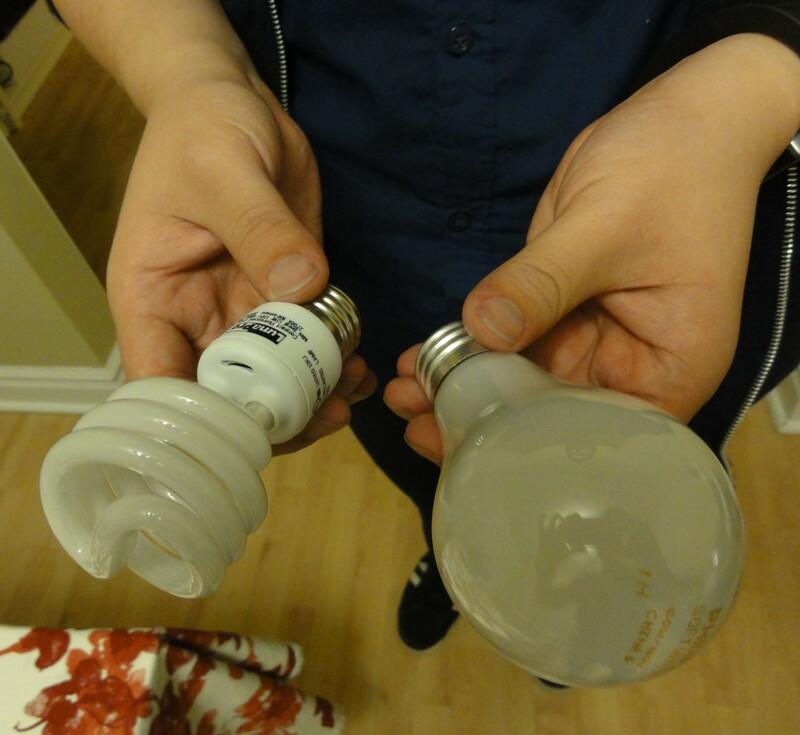 Out with the old, in with the new: Haoran Yu shows a 70 watt light bulb next to the more energy-efficient, 13 watt CFL bulb he used to replace it. The ambassadors next checked my fridge and freezer to make sure they landed within a zone that maximizes energy consumption without jeopardizing food safety. Both passed the test: at 36 degrees Fahrenheit, the fridge fell into the safety zone of 32 to 40 degrees; while the freezer, at two degrees, was pretty close to the ideal temp of zero degrees. They then checked water flow on my kitchen and bathroom faucets, finding that a simple device called an aerator could slow my unnecessarily-fast kitchen tap from about 2.5 gallons-per-minute to a more reasonable, usable rate of 1.5 gallons-per-minute. Beyond the basics, the ambassadors offered me tips for winter insulation, including the possibility of installing thermal curtains or plastic over my windows to reduce drafts. They kicked down the amped-up heat level on my water heater. They reminded me to change my heating system’s filter and to clean my refrigerator coils. They even showed me a few low-tech, energy-saving settings on my dishwasher, like an ‘air dry’ function, which I hadn’t even known existed. In short, they turned me into an energy detective, empowered with the knowledge of what to look for when it comes to using my devices more efficiently. Student Energy Ambassadors trained with program partners Rocky Mountain Power and Questar Gas before they began this season of home energy audits. training sessions led by program partners Rocky Mountain Power and Questar Gas. Additionally, the student auditors met with the Utah Rivers Council to learn more about water conservation. The group aims to perform about 75 audits throughout the school year, Carlie says, as well as to make energy efficiency presentations to various student groups on campus. Only students may sign up to receive the audits, which are free and take about an hour. Audits are open to students living in any type of building, including rentals, apartments, houses, dorms, and Greek houses. Participants may receive multiple CFL bulbs, a phantom power-reducing power strip, a high-efficiency shower head, and faucet aerators, all free of charge. Sign up online! For Carlie and Haoran, the audits have been a rewarding experience thus far. “I enjoy being able to teach people, to help people,” says Carlie. Turning sustainability knowledge into sustainability practice, says Haoran, has made all the hard work worthwhile.